This looks like a fun and different build for sure, do you think it will still be cheap this upcoming season as a league starter? A large portion of the items used can be, arguably, called "vendor trash", so it would be surprising if they aren't cheap. Nevertheless, there is still the possibility that the build will blow up and popularity drives prices up; it's very rare for that to happen though, but I have seen it first hand with one of my previous builds. Even if the build blows up though, it will most likely take a good bit of time for word of mouth to spread, so if you are playing it as league starter, you should be fine. The biggest risk of that happening to is the abyss jewels, but now days with fossils, there's no reason you can't craft your own, so keep that in mind. First, a short rant: I don't like hand-holding people through every step of the process. Struggling, feeling lost and doing research are all part of the game and will make you a better player for it. My guides are about presenting you with everything you need to make a build work, showing you through video evidence that it does indeed work, and letting you figure out how to best take advantage of the information presented. Nevertheless, I am aware that leveling this can be tricky. Specially if you are planning on doing what I am planning, which is to try to use HoA itself to level. If I can get a decent stack of poison/virulence in early game with Viper Strike, then it shouldn't be a problem. 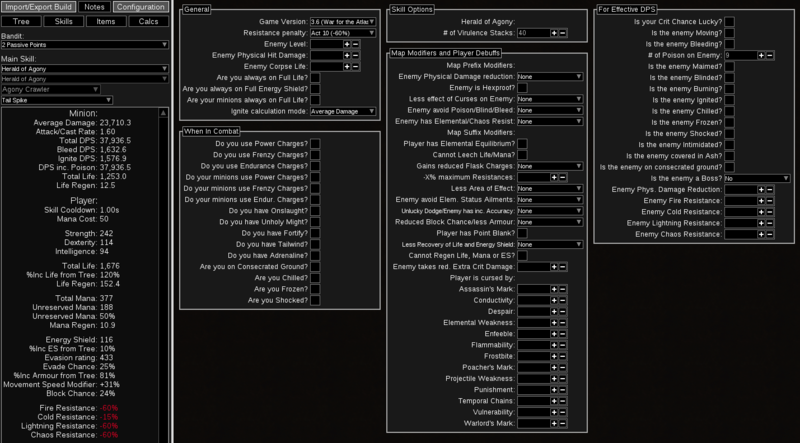 The gear is just whatever gave me some key bonus, like Dexterity and fit within the lvl reqs. It's just an example, but def not impossible to acquire. Will it work? I dunno. But as I said, that's all part of the game. Nice, I was wondering on the leveling. I always like to play the build asap rather than respeccing or using other skills. I'm gonna split my starter time between this and my Incinerate Elementalist. I'm still a newbie in terms of crafting as Betrayal was my first league, so I'll be coming back with questions further in the league. Any idea how this matches up damage wise with the Occultist version? You're always welcome to ask anything you want, but beware I may just point you in the direction of where you can answer your own question. 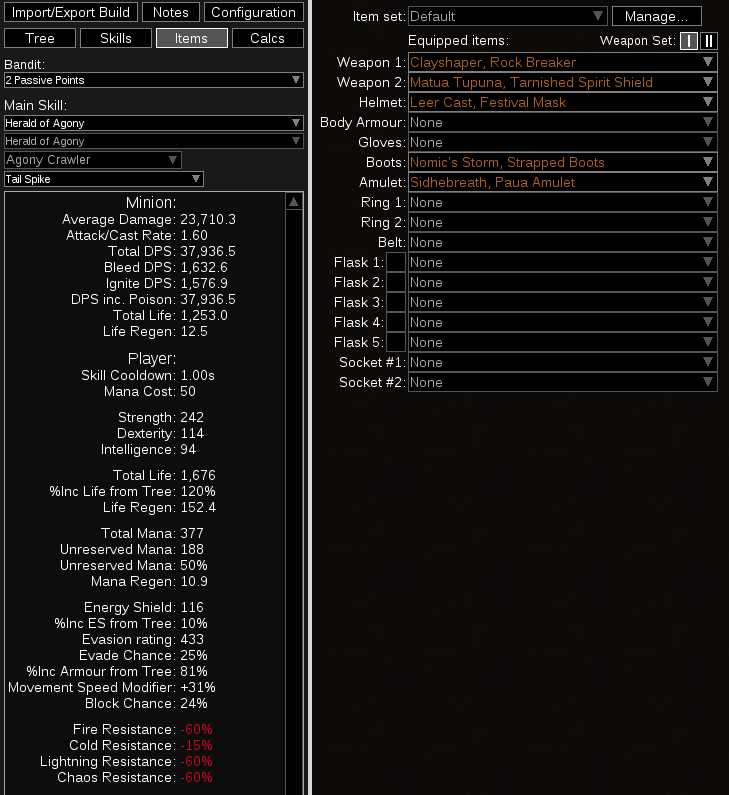 It's a nice Occultist build, but you can judge for yourself the DPS. Looking at their PoB I couldn't figure out how they are granting Frenzy Charges to Minion, even though they have it enabled. It may be I just missed where it is getting it from, but that's a huge boost to DPS, as Frenzy applies at a bonus to minions. His gear requirements are much stricter than mine. That bow is pretty ridiculous. Either way, you should be good if you choose to go with that version. I'm more set on your build as it's a lot more tanky and could probably Delve with it? I just started mapping and doing bosses last league but didn't have a chance to run all of the high end stuff. I was just curious as to how it compared in terms of dps as I was looking at that build last league. Once I saw yours I was converted. I don't mind learning as I spend more time reading than actual playing. So pointing in the right direction may be just what I need as I have a long way to go in terms of learning the mechanics behind many builds. So you're gonna level this with Viper Strike and Herald of Agony? I guess the desecrate is for Vaal Detonate Dead? So, already doing HoA and it works just fine! 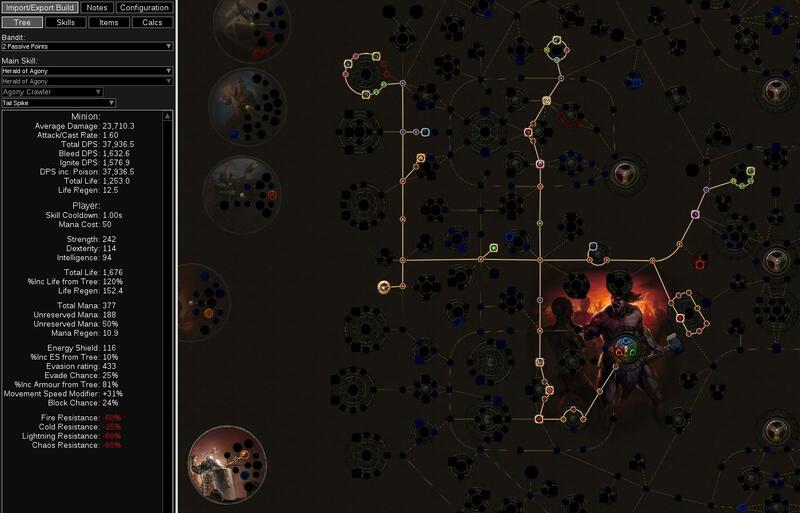 Also, about Delve, you should be able to go pretty deep, if you follow the HC recommendations I have in main post.